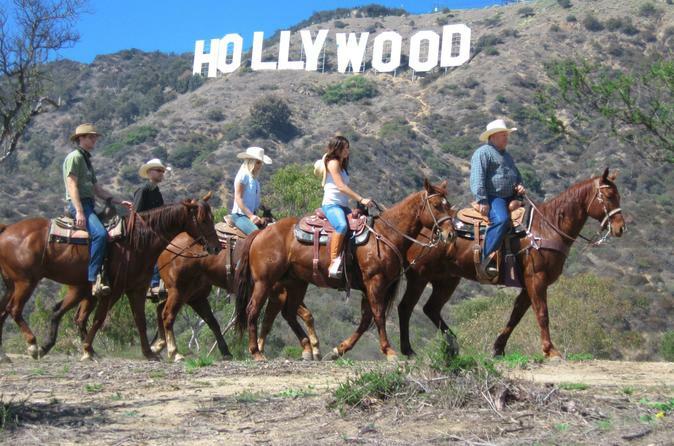 Horseback ride near the Hollywood Sign PLUS roundtrip shuttle transfers! Get the best view of the Hollywood Sign on this scenic 2-hour horseback-riding tour. Following your expert guide, travel by horseback through Griffith Park to the top of Mt Hollywood. Ride near the world-famous sign and enjoy sweeping views of Los Angeles County from this unparalleled vantage point. Definitely a lifelong memory. You’ll be picked up from your Los Angeles hotel in the morning for a drive to Sunset Ranch Hollywood. When you arrive, you’ll be greeted with a stellar view of the Hollywood Sign. After a brief safety orientation, hop on your horse and follow your guide on a 2-hour ride along scenic trails. Ride to the top of Mt Hollywood, the tallest peak in Griffith Park. Spot the famous domed Griffith Park Observatory, and then stop to savor jaw-dropping, sweeping 360-degree views of Los Angeles County. Other than hiking on foot, this is the best vantage point to admire the Hollywood Sign and the city sights! After your unforgettable ride, reminisce on your scenic experience on the drive back to your hotel. Depending on traffic conditions, total transport time to and from your hotel and Griffith Park will be between 2 and 3 hours.